AFI is proud to highlight the AFI Conservatory alumni featured in the 88th Academy Awards®, which followed an unprecedented awards season run for AFI graduates. 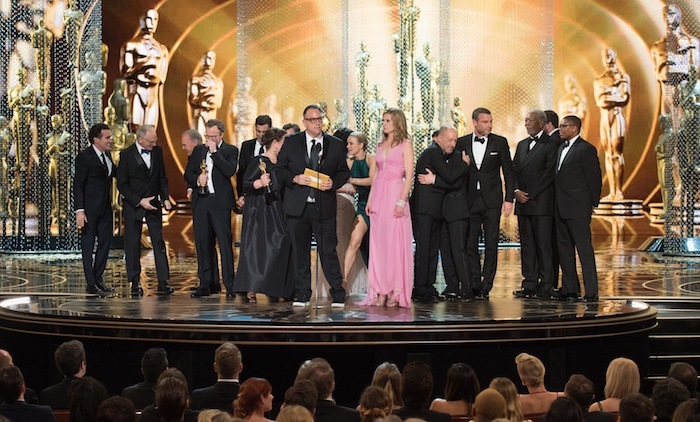 Producer Steve Golin (AFI Class of 1981) received the Best Picture Oscar® for SPOTLIGHT. The film’s credits also include cinematographer Masanobu Takayanagi (AFI Class of 2002) with a special thanks to Pulitzer Prize-winning Boston Globe journalist Michael Rezendes (AFI Class of 1999), played by Mark Ruffalo in the film. Read our interview with Rezendes here. Academy Awards® photo: Aaron Poole / ©A.M.P.A.S. Congrats to all the Winners & Nominee’s of AFI … You all are the “Class” of our org. It just goes to show you that hard work, determination and of course … A little bit of luck … What can be accomplished ! ! Congrats to all the Academy Award Winners & Nominee’s of AFI … You all are the “Class” of our org. It just goes to show you that hard work, determination and of course … A little bit of luck … What can be accomplished ! ! these stories need to be told and you have done it so well. Thank you AFI Conservatory for your training of so many wonderful film makers. D. Scroope.